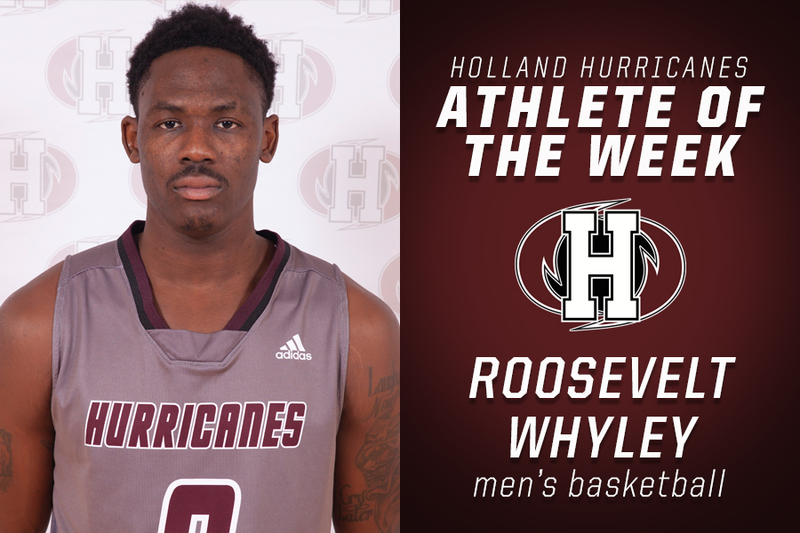 Women’s volleyball player, Abby Hyndman, and men’s basketball player, Roosevelt Whyley, have been named the Holland Hurricanes Athletes of the Week for the week ending December 2. Hyndman, a first-year right-side with the Hurricanes, led the team to back-to-back home victories over the weekend. 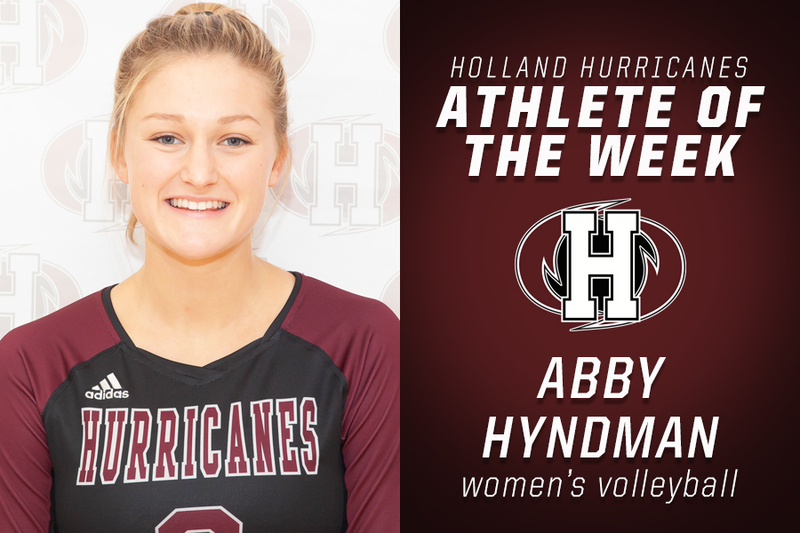 On Friday versus the Mounties, Hyndman’s 19 kills led the ‘Canes to a straight-set sweep over Mount Allison; she also led the team with three service aces and 11 digs. On Saturday versus the UNBSJ Seawolves, she led the team with 18 kills, while adding seven service aces and 11 digs in the four-set victory. Hyndman is currently in fourth place in total kills in the ACAA this season; she is studying in the Graphic Design program at Holland College and is from Charlottetown, PEI. With the victories, the Hurricanes now sit at 7-3 on the season and in a tie for second place in the ACAA standings. They’ll return to action on January 12 and 13 when they host the Université de Sainte-Anne Dragons at the Holland College Centre for Community Engagement. Whyley, a fifth-year forward, in his fourth with the Hurricanes, helped Holland College earn two victories in Halifax, Nova Scotia over the weekend versus the UKC Blue Devils and MSVU Mystics. On Saturday versus UKC, Whyley scored 21 points, 14 rebounds, six assists, four steals and two blocks in a 109-77 victory. This was followed by 19 points, 10 rebounds, three assists, one steal and two blocks in a 112-89 win over the second-place, MSVU Mystics. Whyley also became the new all-time points leader for the men’s basketball Hurricanes on Sunday, reaching a total of 1254 career points. He passed the previous record holder, Chase Bowden, who held the record with 1244 points. Whyley, who leads the ACAA in rebounds per game and blocks per game this season, is studying in the Heritage Retrofit Carpentry program and is from Nassau, Bahamas. The men’s basketball Hurricanes now sit at 8-0 on the season, leading the ACAA standings with the MSVU Mystics sitting in second at 6-2. The ‘Canes will return to action on January 12 when they visit the UNBSJ Seawolves in Saint John, New Brunswick, before hosting the Mount Allison Mounties on January 13. Connect with the women’s volleyball and men’s basketball Hurricanes by visiting www.twitter.com/caneswvballand www.twitter.com/canesmbball. For more information on the Holland Hurricanes, please visit www.hollandcollege.com/athletics,www.facebook.com/hollandhurricanes,www.twitter.com/hc_hurricanesand www.instagram.com/hollandhurricanes.